Skills and Abilities: Ashley is very proficient in unarmed combat. Powers: Ashley has super human strength. In the alternate future time line shown in wolverine’s “Old Man Logan”,Ashley is the daughter of Clint Barton (formerly Hawkeye) and Tonya Parker-Barton the youngest daughter of Peter Parker aka Spider-Man (and an unknown black woman). As a child she trained with her father and learned about a time when heroes ruled. It’s also known her father abandoned her family while she was still a child. 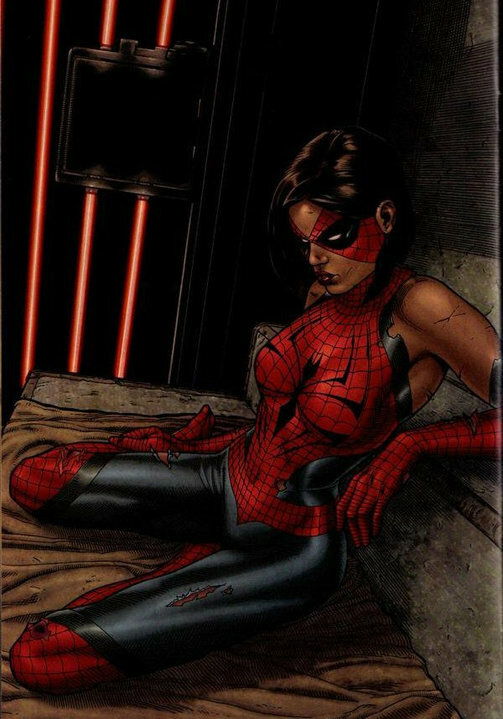 As a young woman she wears a facsimile of the old spider-man costume and banded together with a few other brave new age costumed fighters modeled after the Avengers and attacked the Kingpin‘s Las Vegas strong hold. Her team was captured and killed while she was imprisoned. Her father and Wolverine rescued her and that’s when she revealed after killing Kingpin that her plan was to take over his territory. She attempts to kill her father and Wolverine and they flee. She sends a large portion of her army to kill them. It’s assumed she remained and ruled Las Vegas as the new Kingpin [Wolverine #67 and #69, 2008].